This mod tries to add a challenge to the quest "Power of the Atom". In Vanilla Fallout 3 you only needed your Explosive skill to sit at the 25 mark to be able to disarm a bomb. Now you need to commit your build a little bit more, needing a skill level of 50 (or 70 if you want some added difficulty). This mod tries to add a challenge to the quest "Power of the Atom". In Vanilla Fallout 3 you only needed your Explosive skill to sit at the 25 mark to be able to disarm a bomb. Now you need to commit your build a little bit more, needing a skill level of 50 (or 70 if you want some added difficulty) in Explosives. 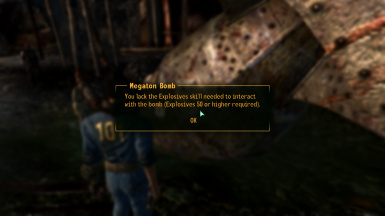 I decided to create this mod after starting a new playthrough and being disappointed with the fact that a "right out of the Vault" Lone Wanderer could disarm the bomb like it was a piece of cake. If it were so easy, with Megaton being a trading route, chances are someone would have done it already. Now a real Demolition Expert is required to do the job. Yes, Man. You do. Do you want a more realistic approach to this quest? Download the main file. Do you feel that 50 is not realistic enough? The optional file is the one you are looking for. This mod is as simple as it gets. It only changes the requeriments to disarm the bomb. Nothing else. Compatible with everything. Recommended with Fallout 3 Wanderers Edition (FWE). Conversion patches for TTW are availabe courtesy of JamesonBarringtonpenny. No Stash packs required. Drop the esp inside your Data folder. Delete the esp and... you're done. Q:Wait, there isn't a mod already that changes this? A: Yes, and it's great, but basically if you use "Power of the Atom reworked" by Volek, disarming the bomb means that you need to murder a bunch of people. If you don't mind that, check his mod. If you prefer a more realistic approach but keeping things simple, try my mod instead. Q: So if I use this mod I won't have an early access to my megaton house, correct? A: Correct. This mod exists for roleplaying and realism purposes. It always irked me that you go from a comfy room in a Vault to a big house in Megaton with a robot butler included. It was way too much and as early as level 2. Now you don't get 500 extra caps as early nor you get a comfy house nor purified water as early either. Now your character has an actual reason to do errands and quests for Moira, Lucy West or the rest of the Megaton inhabitants. You are broke, you need resources, so you will need to work for them. Q:But... where am I going to sleep now? A:Try the Megaton commons or a sleeping bag. Getting a home in Megaton should be rare. It's kinda awkward how in Vanilla F3 a wanderer shows up and gets a very good house as early as level 2. With this mod you will get the house, eventually. And that reward should be appropiate to the effort you had to put in to earn it. The Updated Unofficial Fallout 3 patch (which you should be using anyway) allows you to sleep in the commons with the rest of the settlers, so use that.